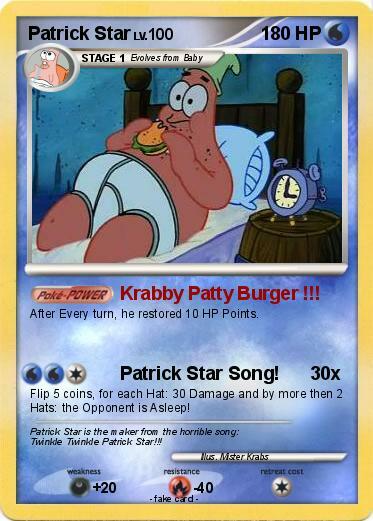 Attack 1 : Krabby Patty Burger !!! After Every turn, he restored 10 HP Points. Attack 2 : Patrick Star Song! Flip 5 coins, for each Hat: 30 Damage and by more then 2 Hats: the Opponent is Asleep! Comments : Patrick Star is the maker from the horrible song: Twinkle Twinkle Patrick Star!! !